The 15th Intergovernmental Commission on Trade and Economic cooperation between the Republic of Tajikistan and the Republic of Kazakhstan was held on 8-9 April 2019 in Nur-Sultan city of the Republic of Kazakhstan under the leadership of the First Deputy Prime Minister of the Republic of Tajikistan Davlatali Said and Deputy Prime Minister of the Republic of Kazakhstan Kasymbek Zhenis Makhmudovich. 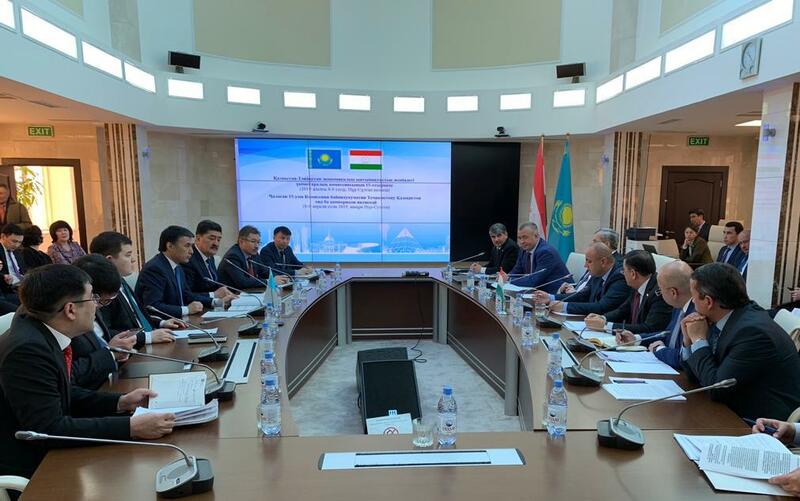 The meeting was attended by representatives of ministries, departments and business entities of the Republic of Tajikistan and the Republic of Kazakhstan. During this meeting the parties reviewed a wide range of topical issues of bilateral cooperation, including the major areas of cooperation in the fields of economy, trade, investment, transport, industry, education, science, agriculture, migration, energy, water resources, health, culture, sports and tourism. The Commission recommended all government agencies and business entities of the Parties to take the necessary measures to deepen mutual cooperation and create a favorable environment for the growth of trade between the Republic of Tajikistan and the Republic of Kazakhstan. On the margins of the meeting of the Intergovernmental Commission on Trade and Economic cooperation between the Republic of Tajikistan and the Republic of Kazakhstan, a meeting was held between the First Deputy Prime Minister of the Republic of Tajikistan Davlatali Said and the Prime Minister of the Republic of Kazakhstan Askar Mamin. During the meeting both sides discussed issues of expanding mutual cooperation in the field of investment attractions, creating joint ventures, as well as building up fruitful cooperation, implementing joint projects of an economic and investment sphere. According to the results of the meeting the Protocol of the 15th meeting of Intergovernmental Commission on Trade and Economic cooperation between the Republic of Tajikistan and the Republic of Kazakhstan and the Roadmap on the increase on commodity turnover between the Republic of Tajikistan and the Republic of Kazakhstan for 2019-2021 were signed.